This guide to green 'retro-fitting' for corporate real estate, facility managers and occupiers struggling to reduce their building’s carbon footprint will help in the planning and management of a sustainable refurbishment programme. Facilities managers have a key role in improving and maintaining a building’s sustainability credentials over its whole life – through benchmarking and developing improvement strategies, energy efficiency measures and installation of low carbon technologies, as well as through waste minimisation and appropriate material use. 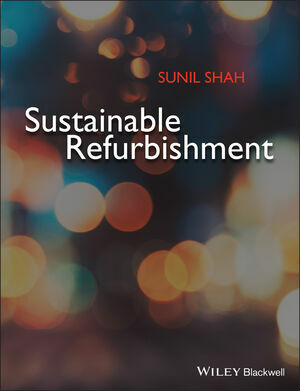 The first part of the book gives the context, providing the structure and linkage between the other chapters, together with an overview on sustainable development and refurbishment projects separately and the value gained from a sustainable refurbishment. Part 2 details the regulatory and financial drivers, together with market pressures, and provides an overview of where this is leading together with the implications for sustainable refurbishment. Part 3 provides technical support on carbon measures, helping to determine the feasibility of good practices as part of the refurbishment. Included is a review of energy efficiency, renewable and low carbon technologies and embodied carbon to enable lifecycle carbon calculations, together with the necessary behavioural change aspects needed to embed the changes. Linkages and benefits between the technologies will be highlighted. Part 4 reviews refurbishment from a wider environmental perspective, understanding the challenges and opportunities that exist for particular developments from a materials, water, biodiversity and transport perspective. Throughout the book, checklists are provided on typical activities and good practice that should be performed. These are expanded through relevant case studies and examples to show-case previous good practices and lessons learnt. The book is structured to allow a matrix approach, with Parts 3 and 4 providing the technical information necessary to deliver a sustainable refurbishment; with sector relevance and best practice with case studies throughout the book.